BA( Hons); Dip Teaching; Master of Guidance and Counselling; Cert. in Celebrant Studies; Cert. in Clinical Supervision. Winnie sees her role as a lecturer as bringing together her life skills as a secondary teacher, a counsellor and supervisor, and a celebrant. She trained in 2007 and went on to co-author “Be Fertile with Your Infertility- creative ways to acknowledge the infertility journey using ceremony and ritual” in 2008. Winnie enjoys creating ceremony with couples embarking on marriage together and working with families to craft funerals and other life transitions. 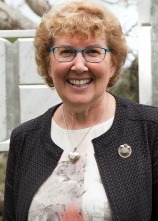 In addition to teaching, her days currently involve a wonderful balance of caring for parents, private counselling and supervision from home, infertility counselling at a clinic, and her celebrant role.